Chelsea players have reportedly become concerned that midfielder Jorginho is something of a teacher’s pet of manager Maurizio Sarri. The Italy international was an initial success upon joining the Blues in the summer, following Sarri from Serie A side Napoli to Stamford Bridge. 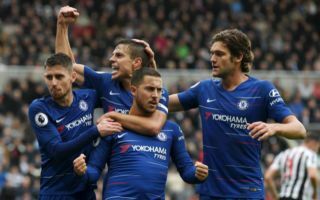 However, Chelsea’s fine start has recently derailed, with the club losing six times since the end of November after initially making an unbeaten start to the campaign. Jorginho has been singled out for criticism by pundits, with Sarri seeming to take a bit of a risk by building his entire team around the 27-year-old. According to the Telegraph, Chelsea players have brought this issue up, but there is the feeling that he’s considered too important by Sarri to consider making a change. This will be a concern for CFC fans, who surely want to see N’Golo Kante return to his preferred role and give Jorginho – who is undoubtedly a fine player – more support in midfield.